Read all our other Trial of a Time Lord articles and interviews here. This is the first time I've watched Trial of a Time Lord trying hard to think of it as one fourteen episode story, rather than four individual adventures. It helps. The courtroom scenes, which previously seemed rather tedious breaks between the actions, now seemed more effective. Colin Baker, Michael Jayston (The Valeyard) and Lynda Bellingham (The Inquisitor) give strong performances to. Bellingham can be sympathetic but icy by turn. Jayston has a certain acid charm that makes The Valeyard more than a cardboard cut out pseudo-Master. Whilst some of the initial 'banter' between the Doctor and The Valeyard verges on the tedious Colin Baker does excellent work in the Court. His reactions to Peri's death, for example, feel right. Viewing it as one adventure also means that 'Mindwarp', which I loathed on last viewing and still think is the weakest segment of the Trial, made me less annoyed this time around. Colin Baker has spoken of his difficulties with 'Mindwarp' because he didn't know whether the Doctor's unsympathetic behaviour was the result of the Mentor's machine; Matrix fakery or if it was a ruse on the Doctor's part. This 'nasty' Doctor bullying Peri seems like a retrograde step to me and the whole story aggravates me. It still does a bit but viewed as part of the Trial it seems Matrix fakery is a likely explanation, even if it isn't explicitly stated. The problem is this is not the time to be making the Doctor unsympathetic. The BBC wants to cancel your programme for heaven's sake so try and make an effort someone. With it seen as one adventure there's also the benefit of seeing a conspiracy gradually unmasked. 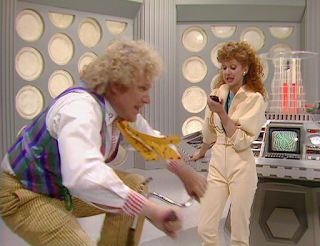 The Doctor's stumbling upon Ravalox - aka The Earth - leads to a panic amongst the High Council. It was they who shifted the Earth (and its solar system apparently) a couple of light years across the Universe in order to prevent the Matrix's secrets being stolen and the Doctor's arrival provides them with both a problem and a solution. They organise a Trial, set up The Valeyard to prosecute and hope the Doctor can be silenced: permanently or otherwise. The Valeyard is a problem though. In the final two episodes it is revealed - by The Master amusingly enough - that the Valeyard is The Doctor. An amalgamation of the Doctor's dark side cobbled together somewhere between his twelfth and final regeneration. But how? By whom? Why? The Valeyard wants the Doctor dead so he can claim his future regenerations so he can be unencumbered by his 'spurious morality' I assume. How does that work without ripping up the web of time precisely? In fact how does bringing back a future Doctor through Gallifrey's timeline work in relation to THE LAWS OF TIME? The Valeyard is a pitch idea: 'What if the Doctor went evil?' It is the detail that is a bit ragged. Enough of my idle waffle what of the story? We begin with a fantastic special effects sequence as the TARDIS is dragged to a space station. I'm not sure why a space station & not Gallifrey itself. Perhaps someone forgot to book a meeting room. Anyway the wonder of that special effects sequence is immediately bought crashing to - er - Earth by the flat, white & brown set into which the TARDIS materialises. We are obviously in that period of Gallifreyan history where they outsourced their interior design to those people who design satellite offices for major corporations. Once the Trial is up & running it turns out that the format will involve us - and the Time Lord’s - watching a number of the Doctor's adventures unfolding on a big screen via the magic of the Matrix (TM). 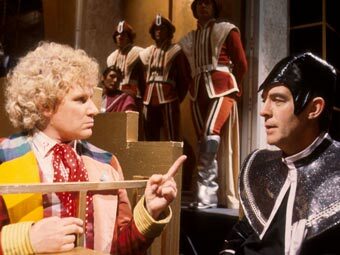 Occasionally it will be interrupted for The Doctor and the Valeyard to snark at each other whilst The Inquisitor referees. You've almost got a DVD commentary on 'Trial' before you start. Our first 'episodic segment' is 'The Mysterious Planet'. 'The Mysterious Planet' is a bog standard Doctor Who story. Not great but not terrible. The Doctor & Peri (who has a new haircut & sensible costume) are much friendlier than in the previous season and I think it helps that Nicola Bryant seems to have become much more comfortable with the role. There's a fun guest appearance by Joan Sims as the 'Warrior Queen' Katryca, who is doomed to meet a pointless and sticky end. Tom Chadbon - last seen as the punch-happy Duggan in 'The City of Death' - does a fine job as Merdeen. Initially looking like 'The Immortals' chief henchman it turns out he's been syphoning people out of the Underground & up to the surface. It is nice to see him take a few moments to regret having to kill Grell (Timothy Walker) rather than just do the usual kill & move on. Also putting in a nice, understated performance is Adam Blackwood as Baltazar, reader of the Sacred Books. The way he says "H M Stationery Office" with reverence is comic loveliness. Stealing the show though is Tony Selby as Sabalom Glitz, an inter-galactic wide boy on a mission to nick some mysterious 'secrets'. He's accompanied by the slightly dim Dibber. The relationship between the two is realistically male. The Sixth Doctor & Glitz make an amusingly spikey pair. Glitz clearly can't be trusted not to sell his own grandmother. There's hints that all the amusing bluster hides a darker Glitz. After all Glitz and Dibber seemed happily intent upon murdering the Doctor at the beginning of the story, but this isn't particularly expanded upon. The one - or two - major irritants in this story are a pair of blonde fops called Humker (Billy McColl) and Tundrell (Sion Tudor Owen). They're the Immortal aka Drathro's assistants & have no function except to provide some camp amusement & to irritate the Doctor. It is like having a pair of Adric’s squabbling away. With the end of 'The Mysterious Planet' the first inklings of a conspiracy are indicated. In the next story, 'Mindwarp' we start with the Doctor & Peri investigating an arms smuggling operation that has led them to Thoros Beta, which is home to the Mentors. This means a return to the show for Nabil Shaban as Sil gurgling laugh and all. The Mentors Sil and Kiv (Christopher Ryan) along with Nicola Bryant are the best things in 'Mindwarp', which I have already indicated isn't a particular favourite of mine. There's lots of odd - if not poor - performances from various minor characters, which doesn't help much. There is an absolute clash of acting styles between Patrick Ryecart as Crozier & Brian Blessed as King Ycarnos. One all silky quietness, the other roaring about like a demented lion. Much as I like Brian Blessed he is just a bit too Brian Blessed in this. He's so full on that everything else looks rather subdued and false by comparison. It's fun but it's too much and it makes the possibility of Peri settling down with him in happy matrimony seem ridiculous. Having said all of that the last moments of this story when Peri 'dies' and her body is made a receptacle for the mind of Kiv are amongst the most powerful in the whole of 'Trial of a Time Lord'. Colin Baker's reactions are heart-breaking: a combination of guilt, anger and grief. Peri is dead. Her mind deleted by Crozier, her body zapped by Ycarnos. All part of the Time Lord plan to stop Crozier's experiment from succeeding. Nicola Bryant is great in those last minutes. And so, in the final instalment, the Doctor goes forward to the future & 'Terror of the Vervoids'. He has a new companion, Melanie Bush played by Bonnie Langford. Bonnie Langford gets a lot of flak, some of which is deserved and some of which isn't. She certainly more theatrical than television when it comes to acting styles and that relentless enthusiasm can set your teeth on edge but it isn't entirely her fault. Making Mel some kind of caricature of how people imagine Bonnie Langford to be didn't help. It's as if JNT decided that have cast Bonnie he might as well get the most Bonnieness out of her. If they'd given Mel a proper background & personality & not just introduced her as a fait accompli things might have been different. She's not bad in 'Terror' though. I think working with Colin who is - in his own way - a pretty theatrical actor balances out Bonnie Langford a bit and she drives much of the action in the early episodes. 'Terror of the Vervoids' itself is just an Agatha Christie murder mystery with added psychotic vegetables. It is a four episode McGuffin designed to set the Doctor up for a charge of genocide & his almost inevitable execution. It's not deep or difficult. It just is. I actually enjoyed it even though it was about as substantial as a bridge made of bubbles. 'Terror' moves swiftly in 'The Ultimate Foe' when the Doctor looks done in. The charge of genocide looks open & shut with the poor veggie Vervoids having been wintered to death as a result of The Doctor's plan but just when all looks lost Mel and Glitz arrive courtesy of...(drum roll please)...The Master. The Valeyard gets a bit panicked as The Master nudges everyone along, explaining huge chunks of plot & filling in explanations with a certain degree of smugness. Anthony Ainley does a lovely job of underplaying The Master's joy at getting one over on just about everybody, including The Doctor. For once - at least at the beginning - it looks like The Master plan is coming together nicely. The Master blows The Valeyard secret. The Valeyard dashes into the Matrix (TM) followed by the Doctor. The scenes in the Matrix (TM) are suitably odd. I particularly like the Mr Popplewick (Geoffery Hughes) stuff. Its part Dickens, part Kafka and entirely Doctor Who. Michael Jayston makes the Valeyard even more contemptuous of everyone else as his plans fall apart around him. The Valeyard isn't trying to kill two birds with one stone but several: get the Doctor; get the Time Lords; get the Master and get Glitz. This is a villain with big dreams. Unfortunately the Doctor spoils everything by putting a sonic screwdriver in the works. Although not before Michael Jayston gets to utter one of Doctor Who's most ridiculous lines. "The catharsis of spurious morality" indeed. It sounds like someone has been force fed a dictionary. 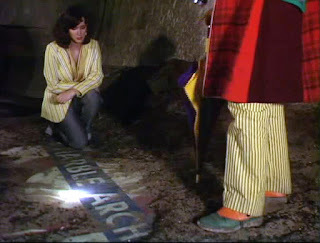 The last words we hear from The Sixth Doctor are "Carrot Juice, Carrot Juice...Carrot Juice". Unfortunately they were to be the Sixth Doctor's last words full stop. After 'Trial of a Time Lord' the Beeb wanted him gone. Colin, angry at his treatment, refused to do a regeneration story and so the next time Doctor Who returned it would be Sylvester McCoy. Colin's treatment was atrocious. He carried the can for failings that were not his. As a Doctor Colin is pretty good. Given the right material & support he can be brilliant as Big Finish have shown. So sadly whilst 'Trial of a Time Lord' does works - Mindwarp blip excepted - fundamentally Colin Baker is on the receiving end of a miscarriage of justice.